The donation was sent by the grassroots nonprofit West Point Women for Health and Development, a GlobalGiving partner working in the Liberian capital of Monrovia. Over the past year, Nelly Cooper, the organization’s president, and the West Point Women have played a vital role in the frontline fight against Ebola. Many volunteered to lead community education and advocacy efforts during the epidemic’s height, even as their own families were affected by the disease. The West Point Women have helped Liberia become Ebola-free, and they have a unique understanding of how such crises impact communities in the near and long terms. You, as part of the GlobalGiving community, have played an important role, too. The work of the West Point Women has been funded, in part, by donations to GlobalGiving’s Ebola Epidemic Relief Fund. We’re so touched by their own generosity and desire to ‘pay it forward’ to other GlobalGiving partners. Most recently, a team of Japanese and Korean volunteers, affected by their own local crises (the 2011 tsunami and 2014 ferry disaster, respectively), traveled to Nepal to build temporary shelters with IsraAID. The volunteers are also providing psychosocial support to earthquake survivors and sharing their own personal experiences with recovery and rebuilding. Special thanks to Menaka Chandurkar for her collaboration on this article. This post was written by Chris Wolz, GlobalGiving Board Member, and President/CEO Forum One. When I heard Saturday morning, April 25, 2015, that there had been an earthquake in Nepal, I let out a gasp and uttered to myself “oh, no.” Oh no. Like many who have lived and worked in Nepal, I love the Nepali people and their beautiful, colorful, chaotic, friendly country. I also know that Kathmandu city is jammed full of 1+ million people, and narrow lanes lined with many shoddily built, and brittle, brick buildings. And I’ve walked through many villages in the surrounding hills, past the humble stone and mud walled homes of farm families, homes that probably won’t withstand an earthquake. Nepal is a place close to our family. My wife Eugenie and I both worked there for four years right out of college. I worked for the Peace Corps and UNICEF and the Nepali Government building drinking water systems in the rural hills near Ilam, and Eugenie was nearby with the Dutch Development Agency (SNV) on a UNICEF women’s microcredit program. We eventually met, as Eugenie’s Nepali village friends had long urged (! ), and, long story short, we started our adventure together as a couple and family. 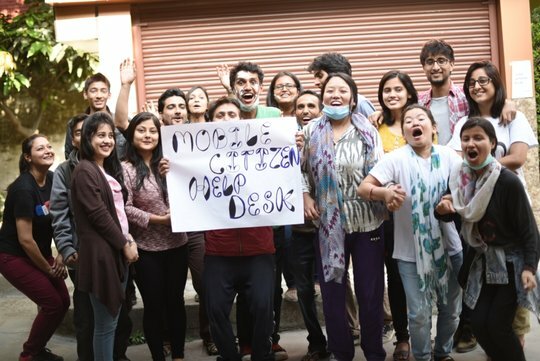 While in Nepal for four years, we lived and worked side by side with Nepalis every day. We came to know them as almost universally friendly, helpful, and kind, in ways we had not seen, then, or since, in the US or Europe. Many of them face daily challenges and struggles that few of us have to experience, but do it while living lives full of joy, laughter, music, and wonder. They will invite you in to be their guest for the best lunch they can muster, and the chance to quiz you about your family and life back home — and laugh in wonder in hearing that a milk cow back home gives about eight gallons (!!) a day. I’m not the first to say this, but it’s really true that Nepal is one of the most special places on this planet, partly because of the mountains, but mostly because of the wonderful Nepali people. Unfortunately, Nepal is also a country that has long had major challenges in economic growth, being an isolated landlocked country with stupendous hills and mountains. In addition, they’ve had domestic political strife and dysfunction for about the past 20 years. And so Nepal’s support systems, social services, health care, housing, power infrastructure, water and sanitation systems are strained and vulnerable in the best of times. This earthquake has been long anticipated, and long dreaded. The area affected around Kathmandu and towards Pokhara is huge, and I expect that it will end up affecting many hundreds of thousands of people, and likely for years. In Kathmandu they will need to rebuild many buildings, water and sewer systems, schools, and more. And in the hills, they will need to rebuild homes and whole village economies. Children waiting patiently for the Wolz family at a school that Eugenie helped to fund 25 years before. 2009. And so, to help these people who are suffering and have limited support systems, and also, for the betterment of global humanity, we should do as much as we can to help the Nepalis rebuild now and in the coming years. I’d urge you to think about how much you typically give to support a humanitarian crisis like this, and then think further about whether you could double it. Or even add a zero. Good karma. This crisis will continue for far longer than it is in the headlines of our papers here. Villagers out in places like Gorkha typically keep their food stocks, rice and lentils for 12 months, stored in bins in their homes, and which may now be under a pile of rubble. The same with any cash or gold they might have. They will not have much to eat nor much to rebuild from. And in villages and Kathmandu, the availability of clean water, and human waste sanitation, are always a challenge; now, those systems are broken, the monsoon is approaching in about a month, and thus cholera outbreaks a heightened risk. I’ve been on the Board of GlobalGiving for four years, and have seen how effective it is in supporting the work of charities in such a disaster. GlobalGiving already has a network of several dozen project partners on the ground in Nepal, working on various projects in education, health care, economic development. And in a disaster like this these groups will also be first to act to help in rescue and rebuilding. Thank you for giving what you can. I know that all donations to this GlobalGiving fund will bring a lot of value to the Nepali people.